Following the motto of striking the iron while hot, Italian metalcore jocksters and horror-metal purveyors Stigma put out an EP The Undertaker on the heels of their still smoldering, comic book dedicated Concerto for the Undead. Catching a spark from that earlier blaze Stigma continues very much in the same style, while adding even more masculinity into their sound due to the presence of Bleeding Through singer Brendan Schieppati and Anaal Nathrakh mainman Mick Kenny at the mixing/mastering controls. The stupid bludgeoning heaviness, however, is never a focus for Stigma and that could be the reason their brand of metalcore is very much entertaining, as the Italians inject their crushing rhythms with plenty of melodic sensibility and their lyrics with a sense of humor. Divine Heresy this one is not. 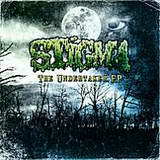 In other words, I find Stigma to be much closer to melodic death than a horde of brutal and/or whining mallcore bands. Beginning with a furious staccato riffing (and I mean furious) on the catchy opener 1,2,3,4 Dead!, the band could pass for the modernized downtuned At The Gates or The Everdawn. Various breakdowns, from faster melodic leads to slower kneecap snappers, and leather lunged yelps provide a sense of reality, but the song flows just fine. Still dressed in a number of melodic vignettes We Are the Deceased yields to a slower, even more stagnating It’s Bullet Time! with its spaced apart howitzer booming riffs and strapping brutal vocals. The Undertaker, taken from the aforementioned full-length, circles the EP nicely and apparently became the fan favorite as the band went on numerous tours after the Concerto for the Undead release. Why not bring something out, fast and melodic, without lengthy breakdowns, which your fans respond to and make some coin using this song as an anchor? A smart commercial strategy for which the band can be hardly faulted. And you will need to be a fan to get this piece of music, since The Undertaker EP is to be issued in digital format only. The sign of the times, I guess. The truth is you can find much worse metalcore than Stigma, and I sort of made this point in Concerto for the Undead review. This little EP only reinforces it.